Your team has a problem. Everyone on the team seems to know what that problem is, but for some reason, no one can solve it. Some might blame it on communication, some might blame it on lack of responsibility, others might not even say there’s a problem. But we all know, there’s an elephant in the room. So, if you’re like any other team what do you do? The simplest answer is team building. Google “Team Building.” Make a call, Schedule a date. Your problems are over? Right. The simplest answer might not be the actual solution your team is looking for. Carlos Valdes-Depena mentioned in his HBR article that you should Stop Spending Your Money On Team Building, but why? Like Forbes Contributor Liz Ryan says, common team building activities don’t address the elephant in the room. They lack a long term plan and accountability for what happens after the team building session. Companies try to handle team building internally which will limit the power an outside facilitator has to get the team to learn on a new level and address tough conversations. Companies will pay billions of dollars annually for team building events with the expectation that their teams will magically transform into a high performance team after the event. These expectations are unrealistic and will go unmet. When you build high performance teams, you have to incorporate a well-designed leadership program that will build trust, raise engagement, and focus on the personal and professional development of each team member. “But not everyone on my team is a leader,” you say. Without improving leadership skills, your team will never transform into a high performance team! Building high performance teams involves strengthening the team’s identity, creating and maintaining standards of excellence, and increasing levels of trust accountability on the team. Yes, that is leadership. In building high performance teams, each team member must increase his or her self-awareness. Without a different point of view, everything will look the same two hours after the team building activity. Without an increase in team self-awareness, you are doomed to the past. In order to see something the team has never seen before, teams must work with a skilled team expert that helps them identify skill gaps, commits to their transformation for the long term, and engages in a continual process of development. Now don’t get me wrong, team building events are fun, and frankly easy to do. 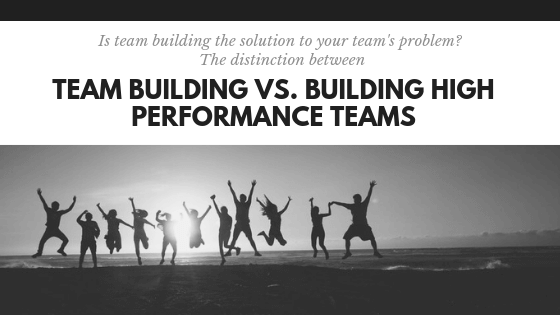 Building a high-performance team, not so easy. But the feeling of being on a high-performance team is priceless. If your team is committed to high performance, and is ready to crush it, call me for your free consultation. business speaker business strategy Executive Coach High Performance Teams how to improve my team leadership development organizational development Team Building team building activities team building events team building retreats team building san diego team development Team Dynamics team leadership coaching team strategy what is the difference between team building and building high performance teams? what works better than team building why does team building not work?